postcard # 22 - Here's a threefer: (1) a period postcard showing the original building; (2) a somewhat later version; (3) a modern photo of the area with the building still prominently present plus a challenge for you to find it. - (1) The original postcard is labelled 'Napoli - Hotel Bristol', the large building just left of center. The photo is taken from the south, the direction of the seaside. There is not now a Hotel Bristol in Naples, but it was once prominent. I know that the building went up in 1867 because there is a plaque with that date at the entrance. The name of the street is Corso Vittorio Emanuele (C.V.E. ), an east-west road running parallel to the Chiaia seaside about one-third of the way up the Vomero hillside. The year 1867 is only seven years after Garibaldi captured the city from the Bourbon rulers. Before that, the street was named Corso Maria Teresa, for the wife of Ferdinand II, the next-to-last king of Naples. The road, itself, only goes back to 1852. It was a major piece of roadwork back then and, in modern terms, a tangenziale, a "by-pass"—you could start at Mergellina in the west (downhill to the left, about 1.5 km away), get on this new road, and come up and run above the main body of Naples and drop down past the center of town and be at the museum and continue on your way or turn off into the city—or go in the opposite direction. Before that, the only east-west passage was along the sea, the Riviera di Chiaia. There was, however, still no way, except steps, to get up the hill from where the photographer is standing, and no south-north road that wound up to the Vomero hill (those 5 buildings at the top) except one road (via Salvator Rosa) that ran all the way up from the museum to the Vomero. That old road was now met by this new C.V.E. after one kilometer along to the right (east), coming in at about a 90° angle. The year 1867 was even before the cable-cars (the 1880s); this part of the city still has a lot of stairways that people use to get up and down. (See Urban Expansion of the Vomero.) This building was an early hotel along the length of the C.V.E., but still about 25 years before the "period" hotels (from the age of Art Nouveau architecture) towards the turn of the century: the Parker's, the Britannique, Bertolini's, which did not go up until the city joined the bottom of the hill (behind the photographer) with the top of the hill (those buildings at the top) with new south to north streets that would intersect the C.V.E. and keep going up. The adjacent large building is (on your right) is still standing and also has a date—1878; thus, the photo must be about 1880. Steam-driven. Those started in 1888 in Naples. This line ran up from just above Mergellina in the west, along the C.V.E. to via Salvator Rosa (mentioned above as the only up-and-down road), at which point you changed to go up or down. You changed, at this point, to a rack and pinion railway for the particularly steep via Salvator Rosa. Look at the other image. 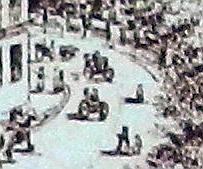 A bit up the road are two automobiles, open-carriage, almost certainly very early model FIATs, meaning 1899-1900. Nice ride. Water-cooled 0.7-liter (679 cc) 2-cylinder, rear-mounted engine hooked to a three-speed gearbox. Top speed of 35 km per hour (22 mph). Lots of parking back then, too! Jumping Jehoshaphat. I know it's been 115 years, but this is nuts. Anyway, if you want to look without being coached, stop reading NOW! Here's the answer. Locate the long cream-colored building, dead-center of the photo (built in 1916, by the way); move to the right, past the two sailboat masts sticking up in front (photo is shot from the Mergellina harbor). The old Hotel Bristol is the next building to your right, still the original dark red. It ceased operation as a hotel in WWI and has been an apartment building ever since. In its hey-day, it was one of the "Swiss properties" in Naples (businesses, hotels, hospitals, even a school). Guides from the early part of the century touted the Bristol for its value as a health resort and called it one of the best hotels in Italy. Richard Wagner stayed there in 1881 (and most likely stiffed them on the tab!). Same old address: Corso Vittorio Emanuele 168.